Two new books on Grace Brethren history, including an important new volume by Dr. Todd Scoles of the Marysville, Ohio, Grace Brethren Church (pictured) are nearing publication by BMH Books. Because they are special-interest books with little outside commercial appeal, the Brethren Missionary Herald Co. recently invited friends and supporters to contribute tax-deductible gifts so that the two books could be produced and distributed without cost to any Grace Brethren churches or missionary units who requested them. With a goal of $14,000, the fund drive is now at $11,780, with 66 giving units having contributed so far. Anyone giving a gift of $25 or more who is also affiliated with a Grace Brethren Church will also become a corporation member of the Brethren Missionary Herald Co., and therefore qualify to vote in upcoming board elections. The other book is Heroes No. 3, a book for upper-grade school children, written by Viki Rife and her father, Robert Cover, Sr., which focuses on character traits and anecdotes from the lives of a number of Grace Brethren “heroes” from the past. Those featured include Bernie Schneider, Angie Garber, Margaret Dunning, Keith Altig, Walter Fretz, James Boyer, and many others. The Scoles book is now in typesetting and the Heroes book is nearly through the editing process. Both are expected to be ready for introduction at the BMH corporation meeting during the Grace Brethren national conference in Tampa, Florida, on Sunday, July 27. Both will also be featured as part of the 300th anniversary celebration of the founding of the Brethren movement, to be held in Schwarzenau, Germany, and elsewhere the first week of August. It’s not too late to contribute to the project. Send your tax-deductible gift (check made out to Brethren Missionary Herald Co.) to BMH, P.O. Box 576, Winona Lake, IN 46590 and when the books are available you, also, will receive a complimentary copy of each. 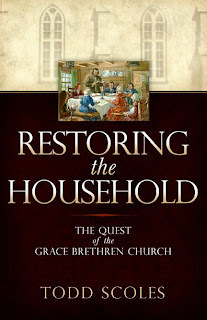 BMH is deeply grateful to all who are supportive of this project to help the Grace Brethren better understand their historical and theological roots, and the context for what today is the Fellowship of Grace Brethren Churches.